WHO: Former Miss Universe & Star of Telemundos #1 Show La Gran Oportunidad, ALICIA MACHADO will join Shades of Blue actor ANTONIO JARAMILLO, Grammy©Awards-Winners Earth, Wind & Fire members VERDINE WHITE and RALPH JOHNSON,Telemundos STEPHANIE HIMONIDIS Chiquibaby of Acceso Total and Actor & Singer ROBERT AVELLANET, formally of the International group Menudo, among others at the 5th Annual Metropolitan Fashion Week Closing Gala & Fashion Awards. The event will feature a one-of-a-kind runway show, the Metropolitan Fashion Awards and a special presentation by LUZIA by CIRQUE DU SOLEIL. Hosted by Metropolitan Fashion Week founder EDUARDO KHAWAM. International Designers to be featured at Metropolitan Fashion Week include: Fashion Designer: BENITO SANTOS (Mexico); Fashion Designer MARIKA SODERLUND ROBISON (Sweden); Fashion Designer BARBARA L ASHLEY (Uganda); Fashion Designer ERICK BENDANA(Nicaragua); Fashion Designer DOUGLAS TAPIA (Venezuela); Fashion Designer EMIL GAMPE (Austria); Fashion Designer CARL ANDRADA(Philippines); Fashion Designer DAVID SANTILLANES (San Diego, CA); Fashion Designer INOE VARGAS (Mexico); Costume Designer RICARDO SOLTERO; Fashion Designer FERNANDA PINHEIRO OF GIOVANNI TESTI (Brazil); Fashion Designer DAVID TUPAZ (Las Vegas, NV); Fashion Designer JULIE DANFORTH (Seattle, WA); Fashion Designer JOEY GALON (Los Angeles, CA);Fashion Designer RITA MEZRAHI (Iran-USA); Fashion Designers SHELLI BLACKNELL & TANISHA BOSTON (USA); Fashion Designer XAVIER OTHON (Mexico); and Couture Hat Designer ARTURO RIOS (Mexico). WHAT: Metropolitan Fashion Week Gala (MetroFW) will showcase a unique, exclusive runway show featuring avant-garde costumes and couture evening gowns created by national and international celebrity costume and fashion designers. This year guests will enjoy a one-of-a-kind fashion show inspired by artwork from The Getty Center. The Metropolitan Fashion Week Closing Gala attracts guests including industry professionals, celebrities, international designers and members of the fashion world. 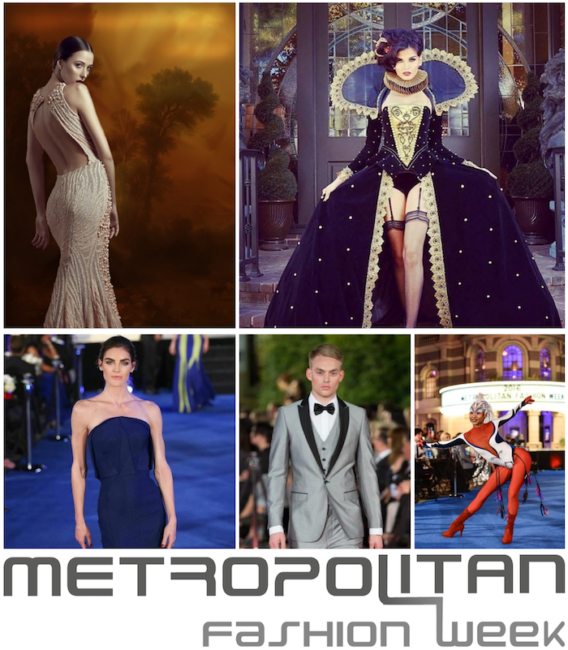 In addition to the runway show and LUZIA by Cirque de Soleil performance, The Metropolitan Fashion Awards will honor outstanding achievements in motion pictures, television, celebrity styling and live performance. A full list of nominees are available at metropolitanfashionweek.net. Get #MetroFW updates by following MFW on Facebook, Twitter, Instagram and YouTube. ABOUT METROPOLITAN FASHION WEEK: Metropolitan Fashion Week is one of the fastest growing fashion weeks in the United States, with shows in Seattle, Los Angeles, Las Vegas and soon, New York and Miami. Metropolitan is the only fashion week in the world that features both Fashion Designers and Costume Designers, from around the world, on one runway. MetroFW spotlights works of art created by international fashion and costume designers and are original “one-of-a-kind” creations.